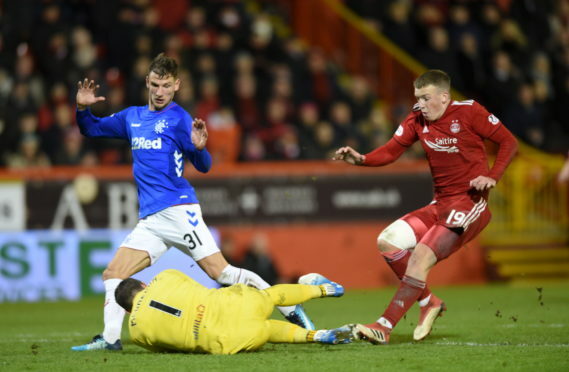 The worst-kept secret in Scottish football is now out – Allan McGregor’s appeal was rejected and the keeper will serve a two-match ban for his foolish studs out at Lewis Ferguson’s shin. Before we go on, we are in no way defending McGregor’s offence – it was snippy, it was malicious, and it was an unnecessary amount of needle where none was needed. But as we discussed earlier, we awaited the outcome of this hearing with great interest given how no action was taken upon either Kilmarnock’s Alan Power for his reckless high boot, or indeed St Mirren’s Paul McGinn for an elbow in the face of Cammy Smith. But Alfredo Morelos was banned for three matches and as we suggested earlier, Rangers played a blinder pushing the hearing for McGregor back till today in order to create a precedented barometer of measurement for what was deemed acceptable. And lo and behold, after McGinn and Power got off scott-free, Morelos’ already significant suspension has been compounded by McGregor’s. The SFA’s clear bias against Rangers is pretty evident now – we’re not defending Morelos or McGregor’s antics, we’re asking why other clubs appear to get away with exactly the same thing, or worse. We’ve known the powers-that-be in this country have been tainted against Rangers ever since the Loch Lomond incident – more on that later. But these days they don’t even bother to hide it. Remember the days when we made jokes about any bad incident anywhere on planet earth and the SFA would fine Rangers for it? Well, it’s going that way with player punishment too. How Rangers are being treated is not even handed at all – there is no level playing field if Aberdeen and St Mirren players are being treated so leniently where Rangers players get the books thrown at them followed by the library, brick by brick. Sadly, unless we see the deeply entrenched and rather insidious regime currently occupying the grass roots of the game north of the border get smoked out, it’s the way it’s going to remain for the foreseeable future. And I think you are too generous re your criticism of McGregor. Ferguson was too late to get ball. If McGregor hadn’t put studs up Ferguson would have smashed him, as he did later to receive only a yellow card. The SFA are a joke. Get rid of compliance officer. Causing more trouble than solving problems. Let refs get on with job. Sure they make mistakes. But compliance officer is making it worse. Hi Alan, we're honestly a bit tired of every offence our players commit being defended as absolutely fine and justified, when they're blatantly not. You wouldn't be arguing Joe Lewis was in the right had he done that on Morelos. Just like none of us dispute Scott McKenna's on Morelos, but many argue Morelos was being a good boy with his studs. If we want consistency with the SFA it would be fair to be consistent ourselves too. The Celtic SFA win again. It is about time our Club issued an official statement in demanding fairness and citing the compliance officers to explain the decisions not to punish Powers, McGinn and others who should have been upgraded to a red. The more our club sits back and does nothing, the more Celtic SFA will ban our players in such a crucial run in. They are protecting and will do anything to get their 10 IAR! Our club needs to fight back against those cheats!! Really it is time we moved to England for a British league and leave these amateurs in the SFA behind. They have all financially benefitted too long from us and continue to treat us like second class members. Ps - Of course it is reasonable for Ranger players to be “punished” where appropriate. But one rule for Rangers and a separate rule for Celtic, Kilmarnock & St Mirren is not acceptable. All Rangers Scottish internationalist should “down tools” for Scotland until the amateur corruption is weeded out! Scottish football is nothing but a total embarrassment! The SFA are corrupt to the core as is the compliance officer. Our club really has to start fighting back against the blatantly biased powers that be! We need to organise ourselves, anything that we support the SFA financially we should boycott. When we go to away games that support Teams that have shown disrespect towards Rangers again we should boycott. I live in England and don't get to many Rangers games but I would be happy to financially support Rangers in any way I can.If we threat to remove ourselves from the SFA and perhaps join the English League we should certainly consider. Who can organsise our substantial support hurt the SFA where it hurts were paying for the compliance Officers to come to our games and use evidence to ban our players how ironic. I predict a riot it seems to me we are getting screwed by another white at septic fa Compliance Officer Claire Whyte needs booted. We've had our differences I.N. but kudos for this article. I have stated on this site and others that you all have a powerful voice and can voice an opinion of many fans. This bile,hatred and sheer disdain shown towards our club and fans has been going on for many years. We all need to create a siege mentality from the top of our club to grass roots. This is not paranoia as the facts are clear for all to see. PLEASE,PLEASE keep up the fight and together we can create a siege mentality,as a favoured son once (correctly) said "NO ONE LIKES US WE DON'T CARE"
Not sure who you are John but thanks! How can you say it biased, you just said at the start of the article that mcgeorgors tackle was malicious and nippy. If the ref sent him off we wouldn't of beat Aberdeen, it was 3-2, we would of been down to 9 men and they would of had a penalty. There was no need for it and he's got away already with a few kick outs at players. At 36 he should know better. Hes just letting the team down the same as Morelos. BB, you seem more intent on attacking our players and missing the point than looking at the bigger picture? Am just calling it how I see it. Morelos isn't doing our chances of winning silverware any good by sitting in the stands. It would be different if he was getting sent off for making bad challenges but it's for stupid, preventable actions on his part. Shagger just seems to want leave a bit on his opponents this season, which he is always going to get pulled for at some point. What your trying to say is that the SFA is biased against Rangers. Every other club claims the same thing. Why was Brown not cited for his shocking tackle in the Hibs game. Why was Siminovic not cited for an elbow that flattened a Hibs player in the same game. Why was Burke not cited for his ridiculous dive in the Hibs game, maybe one of the worst and funniest I have ever seen. Though tellingly I never heard Stevie Clarke complain about it. Why was Power, from Republic of Ireland, not further punished for his head high tackle into the face of Ryan Jack. Why did St Mirren captain Paul McGinn, grandson of former Ceptic chairman Jack McGinn, not get further punishment for a disgraceful elbow in the face of his Dundee Utd opponent. Do you see a pattern here? If you can't you must be cross eyed. And while you are at it do a bit of digging about the background of Compliance Officer Clare Whyte. Then ask how she was appointed, who appointed her, how many people were on the (very) short list, how many people were interviewed, what football related attributes did she have? Robroy for every thing you just stated their, every other club in the league could state the same things happening to their players. They say the refs and SFA are biased against the big clubs. Why did nothing happen to Morelos in the old firm game, that's right he's a Catholic. Power is from Ireland so must be a Catholic, is that what your getting at? You just sound like a bigot. Now I do agree the refs are shocking and the SFA is a complete joke but I wouldn't say they are working against our club. BB, I am far from being a bigot but I can see how you might think that. These are the words of a fair and affable blue nose who has simply had enough of the rubbish thrown at our club. I am trying to highlight some fairly blatant bias being carried out by others. And that's just in the last week. My main point was that McGregor and Morelos have offended in the past and can have no complaints but you would need to be blind to not see the unfairness in the incidents I have highlighted. Yes the same thing happens to other clubs too as a stated in other posts regarding the Hibs player who had his yellow card extended to a red. However, there is one club who these things do not seem to happen to despite the offences being every bit as bad or worse than those who are cited. As for Clare Whyte there must be 2 on the go as there are plenty who attest to her regular presence at Parkhead. So who is she? Let's hear from others. Use the anger to push forward. They hate us and everything we stand for but if we channel the anger then it can work in the teams favour. No one likes us we care! Lets Go! You are right not to defend McGregor or Morelos , they were both daft to get involved in these incidents , but there are equal and worse offences going unpunished .S.G will be quizzed about this on Thursday with the mhedia waiting to make headlines of anything he says. My suggestion is that he has his presser in front of a screen playing examples of bad challenges ignored by the C.O .Ferguson , Brown at least twice v Hibs, Simunovic , Power, McGinn and as many as they can find .That way he can refuse to comment while they look at the bias with their own eyes. No one mentions Ferguson's blatant retaliation some time later with a deliberate kick at the keeper. The SFA's very last piece of 'plausible deniability' is over. We're sick to our stomachs, of these double-standards. We need to come up with a viable strategy to 'punish' these green-biased arseholes. Hit them where it hurt most. In their pockets.